Like Sancho Panza, my paternal grandmother spoke in proverbs, only they were in Russian rather than Spanish. One I remember from childhood was Тише едешь, дальше будешь, pronounced loosely teeshe yedesh, dalshe boodesh. The meaning is “The slower you go, the farther you get.” The English proverb puts it the other way around: Haste makes waste. “Suzanne takes you down to her place near the river. And, Everything in its own time. Good spotting to find this beautiful caterpillar. That’s another bit of wisdom that can be hard to learn, especially for impatient sorts. As for the caterpillar, he was well off a formal pathway, trucking along on his plant at a steady pace and moving more quickly than I realized a caterpillar could move. It was fascinating to watch him go from plant to plant. A little hairy man on a mission. And aren’t we glad for it? It will fly soon enough. And look how pretty it is when it gets its wings. One thing’s for sure: even if it could survive, it would be hard to find in your territory right now. I’ve seen some pretty impressive snow reports — your whole world seems to be turning white. The forecast is for up to 20″ in the next few days. It’s finally winter! It’s a nice one, isn’t it? I was glad he was so accomodating; he clearly was willing to have his photo made as long as I let him keep eating and traveling. I did a quick image search, and discovered some impressive and highly decorated creatures from that area. What a trip that must have been — given Taman Negara’s protected status, it must be filled with beauties galore. But there’s always something interesting lurking around, as this little creature proves. All those bristles seem to say “don’t touch me!” Some caterpillars that have similar ones can cause quite a serious reaction. This one isn’t poisonous and doesn’t sting, but I’ve had an entirely too up-close-and-personal encounter with an asp: the southern flannel moth. It’s the cutest darned thing, in an English sheepdog sort of way, and looks like it ought to be petted. Unfortunately, every little hair is a miniature hypodermic needle, just waiting to inject the toxin. I just brushed one with the side of my arm, and it was the worst pain I’ve ever experienced. Love the quote, and this is a beautiful photo. However, now that we’re waaaay below zero, I kind of wish Nature would hurry a bit toward spring!! As usual, we’re lagging behind you. Despite our December snow, we were soon back up into the 70s. But now it’s 43F, heading for the mid-30s, and next week we may have four days with lows in the 20s. Of course it’s nothing like your winter, but it’s cold enough to reduce certain insect populations — like mosquitos. It is interesting working in cold weather. Once it’s below 45F, I can’t varnish — those days have to be devoted to sanding and such. When it dips below 40F? My productivity dips, and I start thinking about coffee and a book — indoors. Nature always has that system of balance going for it, so no rush is necessary. Have a great evening, Linda! It is amazing to watch natural processes at work. We’re such time-obsessed creatures, and so prone to say, “Faster! Faster! that we miss a good bit. Sometimes, just sitting down and waiting to see what happens can be rewarding. You are one who knows!! Walt Kelly always called them “caterpiggles” — which I think suits them better. The adults are spottty on a handsome pale orange background. There is a heedlessness that comes with haste and impatience, whence the waste. Things take as long as they take. My mother has never been able to understand this. She wants everything done right now, then picked up after, cleaned up and put away. Sometimes she reminds me of those moths that fly in frantic spirals, light, then fly in frantic spirals, then light . . . .
How can I have missed the song and the musical? That’s a great clip: not only the song, but also the teacher slamming the doors shut. I had one of those teachers — literally. There may have been a few others, metaphorically. “Things take as long as they take” is a lesson I’ve had to teach customers, repeatedly. People accustomed to constant operating system upgrades and constant increases in computing speed sometimes have a hard time understanding that varnish dries when it dries, whether you’re talking about a small cocktail table or 120 linear feet of handrail. Certainly there are solvents that can speed things up (or slow them down, if necessary) but those changes are marginal, at best. You’ve brought to mind that wonderful comment by Billy Collins: “While the novelist is banging on his typewriter, the poet is watching a fly in the windowpane.” The underlying wisdom applies to more than novelists and poets, of course. Looks like an early float entry for the Rose Parade of Flowers! Wiggle on to the new year…and probably new landscape after next week’s freezing temps. What a creative interpretation. Now I’m thinking of the dragons during Chinese New Year parades. Can’t you imagine a dozen celebrants inside a caterpillar costume, making way through the streets? This is the weekend to do a little light plant moving, find the freeze cloth, and so on. I may do some pruning of the big scheffleras tomorrow, amend the soil, and give them a good watering. If we get a hard freeze, they’ll have to come in, along with the favorite cacti. Hauling plants back and forth’s going to make it finally feel like winter. I am reminded of the tortoise and the hare! Sometimes it’s the best way to go! It’s been forever since I’ve read Aesop’s fable about the tortoise and the hare. I’d completely forgotten that the name of the tortoise was Slow and Steady. That makes the line about “Slow and Steady wins the race” even more amusing. Plod on! Bristling but very handsome its way. 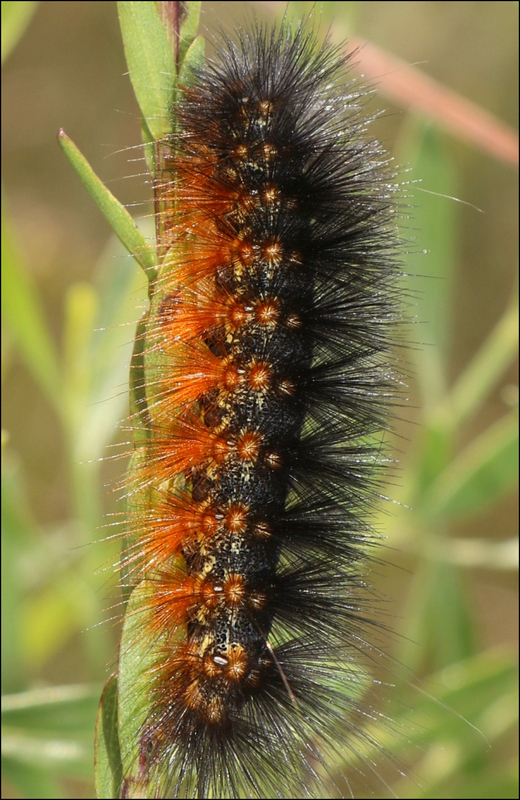 The only Caterpillars I ever pick up are woolly bears, to check out what kind of a winter they’re forecasting, and I will be sure to stay the heck away from the flannel moths! What a gorgeous image, the textures and colors are so inviting. It is a beautiful creature, especially in its adult form. 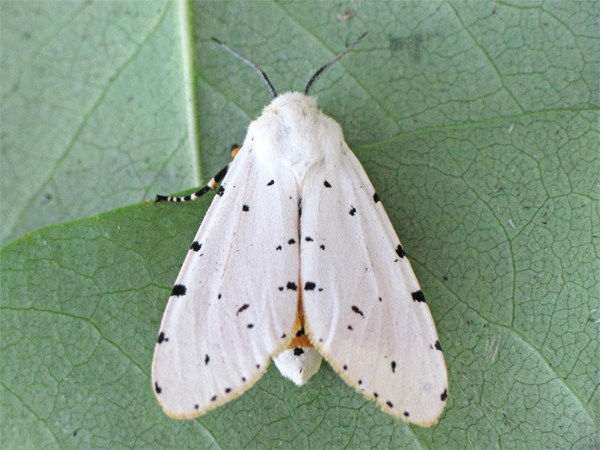 I’ve seen one that’s similar that I think is Hypercompe scribonia, the giant leopard moth. Here’s a nice page about it from Florida. What’s interesting is that it has orange segments, too, but they’re invisible unless it curls up in a defensive posture. I’m slow in identifying some of these creatures, but I’m trying to be steady about it. Isn’t it, though? The complexity of the smallest among us is fascinating, and almost unbelievable. I’ve noticed that the asps around here vary in color from gray to a pale tan, or even almost honey-colored. After my encounter with the southern flannel moth caterpillar (Megalopyge opercularis) I did some exploring and found that there are other stinging caterpillars in Texas: the Io moth, the buck moth and the saddleback moth. They all seem to be just as “delightful” as our asp. Sorry but this one flew away. Anyhow I was having miserable and intense pain with a BP that went over 200/100. I was given steroid injections, BP med and a Demerol injection for the pain. I was kept there for 5 hours until my BP was back to normal. That was back about 1993. Demerol by the way is off market now. I had five stings total- two on one arm and three on the other arm. I can’t begin to describe the pain. PS did not get to proof read the first comment. Five actual stings must have been terrible. Even brushing against one was nasty enough. We finally figured out that they were living in some small oak trees near where I park. There’s a really interesting article here that discusses their life cycle, and how best to dispatch them (clue: let their natural predators do the work). It’s a bit of a slog to read, but it’s got some interesting information. I was most interested in the note that they seem to be attracted to plants that contain tannin or caffeine in their leaves. That means that keeping an eye out around the yaupons is a good idea, too. The answer to your question’s obvious: they’re both right. We may prefer one or the other as a model for our own life (or, more likely, find cheetah speed and turtle speed of value at different times) but they’re both following Thoreau’s advice, stepping to the music that they hear. I’ve never heard that saying about the turtle only making progress when it sticks its head out. That’s a good one — and particularly apropos for the beginning of a new year. Happy New Year! As I have meandered my way through this post, more than once, thinking about caterpillars, and haste and waste, (and the amount of waste/frass https://www.ietravel.com/blog/caterpillars-it-all-poop produced by one caterpillar in its rapid growth period), the time has wandered into 2018. So Happy New Year. So far, so good. And thanks for the smile — I always smile when I remember discovering the meaning of frass, over at BugGuide. Submitted photos that don’t meet their requirements for one reason or another are placed in a section called “Frass,” and then eventually deleted. It’s the best kind of “in” joke. It was warmish here yesterday, and I couldn’t keep myself indoors, knowing that we’re going to be below freezing for the next few days. The Christmas tree is down, to make room for the plants that will have to come indoors, and I’ve laid in some extra bird seed, so now it’s time for all the tasks I let slide yesterday: like putting up New Year posts before the day actually gets here. Having “wasted” time yesterday, I’d best hasten! That’s a good ‘in joke’ !